Do you remember Dave Ritchie? 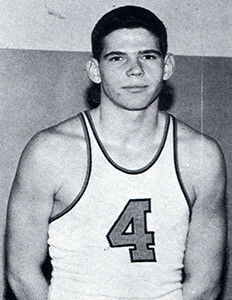 Dave Ritchie graduated in 1956 and was inducted into the Hall of Fame in 2016. Dave moved to Cincinnati and entered Withrow at the start of his junior year and became a two sport varsity letterman (1 in football and 2 in basketball). On the gridiron, he played both fullback and linebacker; and he earned the nickname “Hurricane” against Purcell. At that time, Purcell was the “king” of Cincinnati High School football; and Withrow’s last win over the Cavaliers had come in 1948. In a hard fought contest, Dave ran for 110 yards, scored the touchdown and kicked the extra point in a 7-0 Tiger win. The Tigers went on to win the PHSL League championship and were dubbed the “mythical City champs” in an era before rankings. Dave was named 1st Team fullback by the Cincinnati Post. 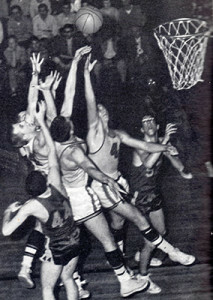 In basketball, Dave was among the leaders in the city in rebounding in 1956. 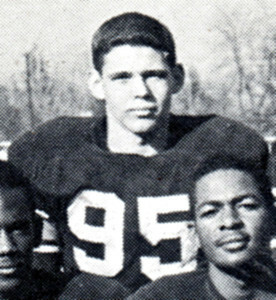 Dave attended Greenbriar Military School and then the University of Cincinnati on a football scholarship. Again playing both ways as a fullback and linebacker, he also punted and led the Missouri Valley in punting average in 1960. Upon graduation, Dave embarked on a 48 year college and professional football coaching career. During an 8 year college coaching career, Dave compiled a 54-20-5 record with assistant coaching stints at Brown University and University of Cincinnati and as a Head Coach at Greenbriar Military School and NAIA Fairmont in West Virginia. Moving to the Canadian Football League, Dave had assistant coaching stints with British Columbia, Montreal, Ottawa and Winnipeg. He was Head Coach for a combined 11 seasons at British Columbia, Montreal, and Winnipeg compiling an impressive 126-82-3 record with two Grey Cup Championship appearances winning in 1994 with BC and losing in 2001 with Winnipeg. Dave is now retired and resides in McDonald, PA.